Hi, I hope someone has an insight on how to remove these buildups? 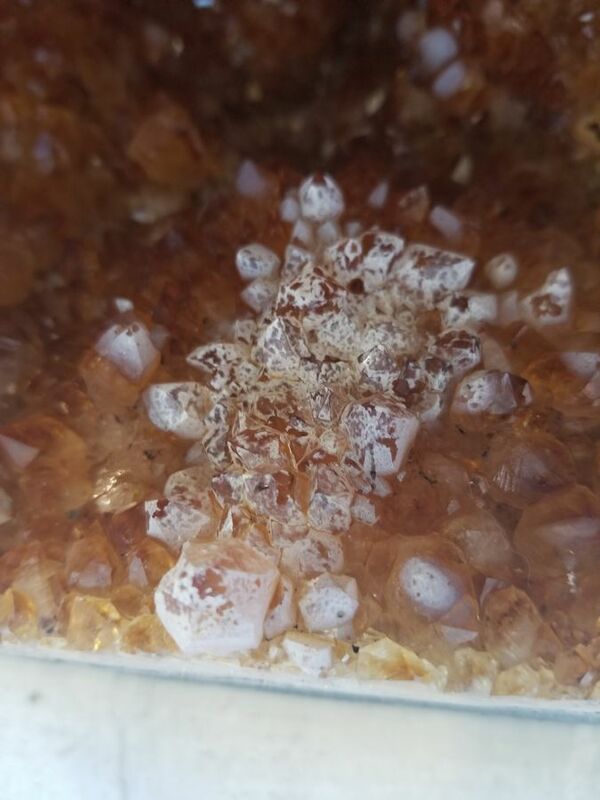 Looks like quartz crystals which often have surface staining from iron compounds as well as calcium and other mineral salts deposits. Quartz is fairly inert to chemical cleaners as well as strong for gentle scrubbing. With that in mind any cleaning you should approach in stages and not rush or assume anything. First up I suggest you soak the specimen in hot water with some dishwashing detergent mixed in and leave it for a week or two. This gives timefor the water to soak into crevices and the detergent to reach deep dirt and oils and start to loosen some surface grime if its there. I always assume it is on all my specimens. This process can’t possibly damage the specimen but it may loosen cracks if there are any. Next week take it out of the water and gently turn it under a running tap to allow dirt to be washed away. Now refill container and place specimen back in and using a toothbrush gently carefully scrub the entire specimen, avoid harsh scrubbing at first as this can force dirt deeper into crevices and force cracks to open further possibly breaking the specimen. If its still “ugly” to you at this point, I suggest looking for a product called CLR (Calcium Lime Rust), this is what its called here in Australia but the product or similar should be available everywhere in the world in supermarkets as well as hardware stores. Its a cleaning liquid used for common surface stains arond the home such as rust on concrete, water marks on windows, scale buildup in kettle and saucepans. as the name indicates its good on calcium stains, lime stains and rust stains. It works by reacting with certain of those compounds and dissolving them which means it can work well in removing similar stains the formed naturally on mineral specimens. WARNING this also means it can react with similar compounds in the mineral specimen and its matrix too. so its important in any chemical cleaning since you cant know for certain if a specimen maybe damged or not to place only a part of the specimen in the cleaning agent and check it visually often to look for signs the specimen itself is reacting undesirably. Typically youlook for signs of bubbles forming on clean areas of the specimen. In your case i suggest find the ugliest edge that contains matrix and the stained crystals to use as a test portion. Using about 1cm of the cleaning solution CLR in a container carefully sit your specimen upright with ONLY the test part submerged. Watch for several minutes, you may see bubbles slowly forming and take note where on the specimen they are. If you have a steady stream of bubbles then something is reactiving aggressively with the cleaning solution and you may or may not want to continue at this point. I usually dont care if the matrix bubbles a lot, but a clean crystal shouldn’t and in your case it may if the staining is reacting fast. Anyway leave it for a couople of hours without touching the specimen, checking regularly. Even if nothing seems to be happening dont touch. Leave overnight and following day list the specimen out and rinse under a tap. Hopefully if the surface staining is being dissolved you’ll see a clear line where the submerged portion was. If it damages the specimen this should be obvious and you should stop at this point. If you think its safe for the specimen to continue I would submerge completely in CLR for a week, maybe two. Depends on how reactive it is and keep an eye on the colour of the cleaning solution, the more it changes colour the more its dissolving. After this rinse under water completely and maybe gentle toothbrush scrub too at this point. Now leave specimen to dry for a few days. The CLR process can be repeated using hydrochloric acid (testing, watching etc) But if you use acid (which isn’t the best cleaner, just one that can works better on certain staining compounds BUT also more likely to harm the specimen itself) you need to take complete precautions. Only use acids outside away from home and important metal items like cars and tools. Hydrochloric acid evaporates to a gaseous form which can linger and condense on/in metal items and rapidly rust them. For the same reason it can damage your eyes, throat and lungs. Its not a glowing green mist like in movies, it’ll be invisible and is VERY harmful. Make sure children are nowhere near and you use masks and gloves etc (check precautions always before using). Plus you will need a legal method of disposing with the used acid and never pour down the drain, you any idea how expensive it’ll be to repair the damage this causes. Basically if you dont know what you’re doing and incapable of taking the precautionary steps then dont even consider acids. They are seriously bad stuff. Bottom line is not all coatings on specimens can be removed , even with acids. But the process about is what I use and its very safe as long as you follow the directions. Some may suggest using white vinegar too as a safe acid alternative but for me I find CLR does the job the best. Its time consuming but worth going through everything above. Water soaking for a long time gets deep into rocks and matrix and helps carry detergent in too. Some specimens may break or crumble but usually a weakened specimen already. Washing under flowing water gently carries away surface dirt. But going in first with a hard brush just grinds hard grains across the surface damaging clean crystal surfaces etc which is why gentle brushing after a long soak andeven then still under water to carry away those harmful grits. The CLR is a purely chemical dissolving so no need to scrub but always test a small area of the sample first to make sure the desirable mineral doesnt get harmed, for example CLR will dissolve Calcite crystals which are high in Calcium. You should be able to find CLR or similar locally as a cleaning product for outdoor surface stains. Wow first, thank you for your long response. Really appreciate your time. 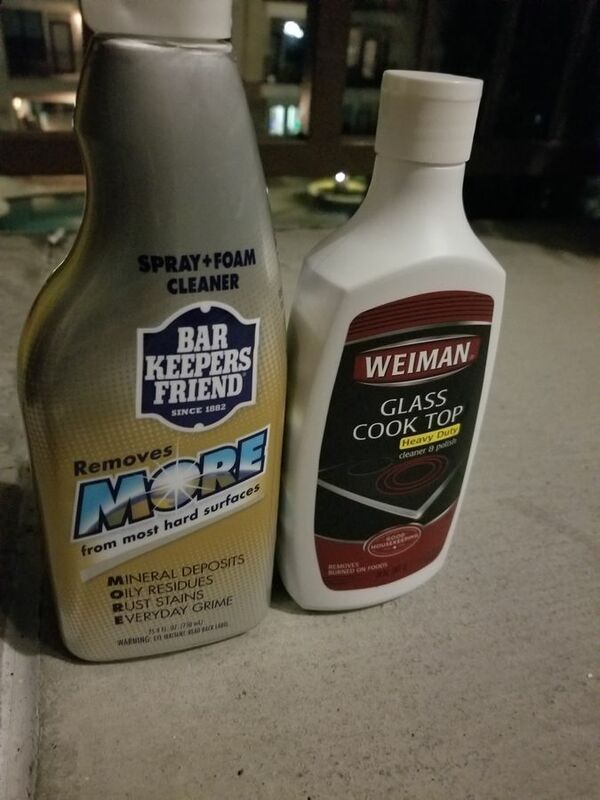 I have tried using several over counter product from hardware store..they are Weiman cook top cleaner and bar keepers friends for mineral deposit and rust stains. But I only sprayed on and used a soft toothbrush to brush without letting it sit in. As you mentioned, do I need to dilute CLR with water? I have not yet tried vinegar. Above cleaners I used were suggested by my local crystal store who sold me this citrine. 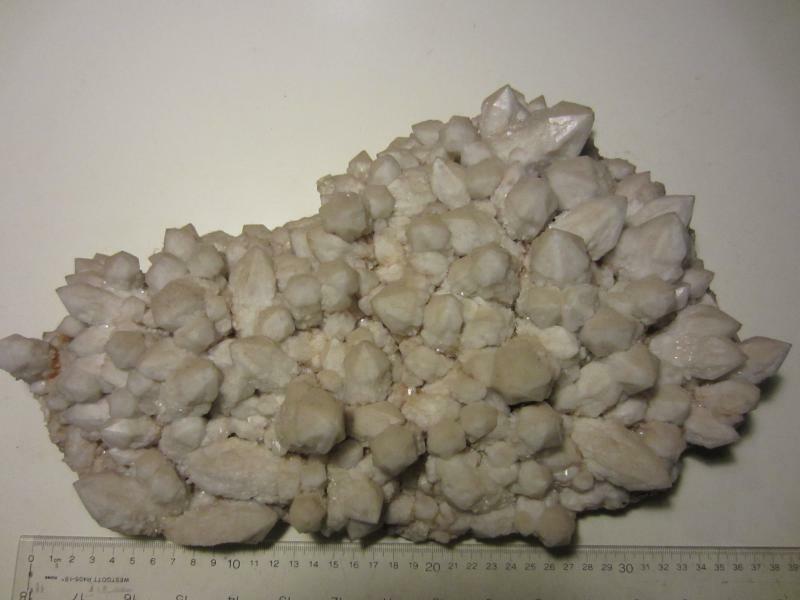 The problem I have is this is a 50+ pounds geode. So I'll definitely need to get a huge container in order to soak it. Do you suggest using oxalic acid? It doesn't look like stain to me. More like a calcium or mineral build up, I wonder if acid can treat it. Thank again for your reply. Before haphazardly trying a bunch of chemicals, you might want to try and identify what the coating is. Place a drop of white vinegar on it, and look with a hand lens. If you see bubbling, it is a carbonate. That will narrow down the list of chemicals. Again using a hand lens, try scratching the surface with a straight pin. If this doesn't scratch through the coating, then it is hard, and may be a silicate coating. You will not be be able to remove that easily or safely. It is not an iron coating that Super Iron Out would help with. It's probably a reaction product caused during the roasting to produce the citrine color. Given the size of the specimen, it location, and relatively small size, if it was mine, I would leave it alone. It provides some contrast. The only thing I might add is that after soaking for a day or 2 and after using vinegar, I would then use a hi pressure cleaning gun. The quartz is stout and many coatings of various types can be removed or lessened with the use of the vinegar and then the cleaning gun. I'll definitely try the vinegar method first. At this point I'll probably stay away from using household items or acid. If it's not a carbonate (reacts with vinegar), it's quite possible that it is a crust of silica, in which case it will not be removable without dangerous chemicals that would also damage the quartz. Got you! What kind of chemicals will I be looking into if that's the case? Someone suggest ed using Hydrofluoric acid "reagent grade". But I don't know how it will affect the crystal? Sounds like soaking in vinegar would be the safest solution. Got you! What kind of chemicals will I be looking into if that's the case? Someone suggested using Hydrofluoric acid "reagent grade". But I don't know how it will effect the crystal? It would probably be hydrofluoric acid - very dangerous - or possibly some other fluorine compound. I don't know the details. 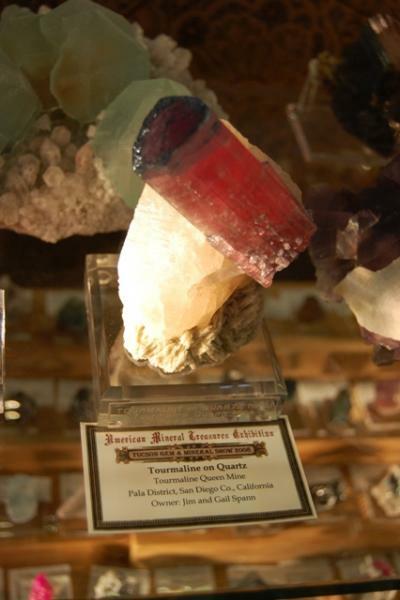 But in any case, if it's a silica crust, any chemical that will dissolve it will also dissolve the quartz. NOT what you want to do! It is not the specimen just a heated amethyst? And then, if heated, how many reactions could have been there? If a calcium compound, would convert in fluorite, also insoluble. To what you r saying this is a heated amethyst? 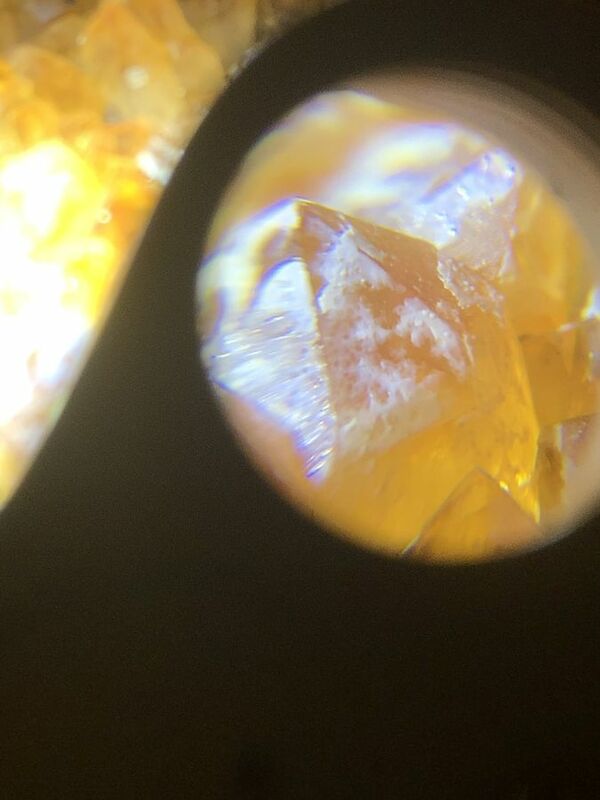 Not a citrine? Yes. See my comment earlier today. Did you not know this????? I think most of us thought you knew this. YES YOUR SPECIMEN IS HEAT TREATED AMETHYST from Brazil. It is considered citrine, but artificially created from heat treating Brazilian amethyst specimens. All very, very common. And as this thread has continued to go on, I will repeat how you should attempt to remove the area of crust. I should note that I have 30+ years of cleaning Indiana specimens and have gotten quite good with lots of experience. First soak in water a day or two. Then get rid of the excess water and put some vinegar on the crust areas. Leave there about 1/2 hour. If the crust is a carbonate, it will largely disappear. If the crust is a silicate, the vinegar will basically have no effect. Rinse well after the vinegar then use a hi pressure cleaning gun to mechanically remove the crust. NO other chemicals as they might damage the quartz and even the backside of your specimen (which no one has mentioned) if the chemicals splash onto the backside. Got you thank you. Yes I m aware. I wasnt thinking right lol. I was think it is a heated citrine, not a heated amethyst. But it make sense now as most citrine out there are heated amethyst. Definitely will try the vinegar method tonight. Due to unbalanced surfaces. 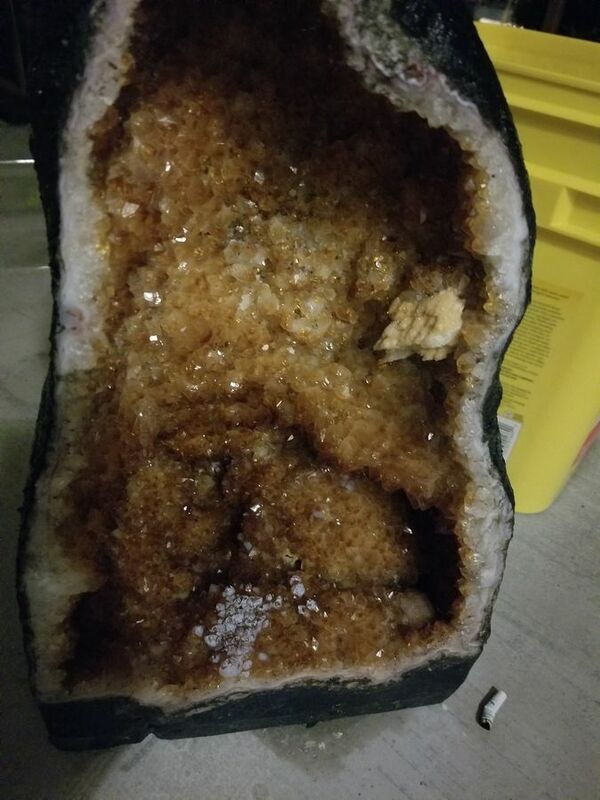 I will almost have to soak the entire bottom of the geode into vinegar. Hopefully nothing cracks or damaged during this process as this is the least harmful way..
And I'm also with GneissWare and Kevin: Think twice if the white coating really disturbs you. It adds contrast and gives the specimen a more "natural" look. As was said before, these heat-treated amethysts from Brazil or Uruguay are very very very common material, even in large sizes, so this white coating makes it at least somehow special.